Advertised as the 100th production of American International studios, Blacula stars actor/singer William Marshall in the title role. 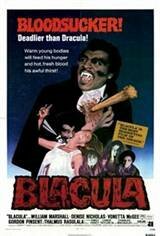 An 18th century African prince, Blacula is transmogrified into a vampire while visiting Transylvania. Two centuries later, he rises from his coffin to wreak havoc in the Watts district of Los Angeles. Blacula's particular target is Tina (Vonetta McGee), whom he thinks is the reincarnation of his long-ago lady love. Thalmus Rasulala assumes the Van Helsing role as the vampire hunter who can't convince the authorities to cooperate. Yes, that is the same William Marshall who later played The King of Cartoons on TV's Pee-wee's Playhouse. A sequel, Scream, Blacula, Scream!, appeared not long after.